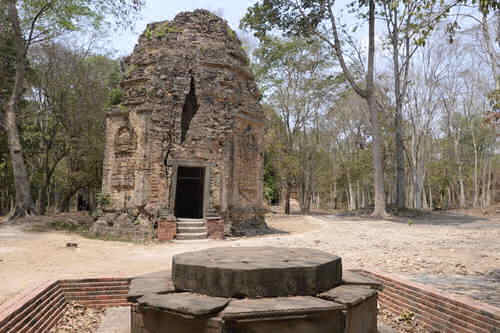 The archaeological site of Sambor Prei Kuk, “the temple in the richness of the forest” in the Khmer language, has been identified as Ishanapura, the capital of the Chenla Empire that flourished in the late 6th and early 7th centuries AD. The property comprises more than a hundred temples, ten of which are octagonal, unique specimens of their genre in South-East Asia. Decorated sandstone elements in the site are characteristic of the pre-Angkor decorative idiom, known as the Sambor Prei Kuk Style. Some of these elements, including lintels, pediments and colonnades, are true masterpieces. The art and architecture developed here became models for other parts of the region and lay the ground for the unique Khmer style of the Angkor period. 크메르어로 ‘풍요로운 숲속의 사원’을 뜻하는 ‘삼보르 프레이 쿡(Sambor Prei Kuk)’ 고고유적은 서기 6세기 후반부터 7세기 초까지 번영했던 첸라(Chenla, 眞臘, 메콩 강 중앙 유역에서 발원한 크메르족의 나라) 제국의 수도, 이샤나푸라(Ishanapura)로 밝혀졌다. 도시 유적은 25km2에 달하며 성벽으로 둘러싸인 도심지와 수많은 사원이 포함된다. 그 중에는 동남아시아에서 발견되는 탑 중에서는 독특한 형태인 팔각 사원 10곳도 있다. 특히 유적 곳곳에서 발견되는 사암 장식인 ‘삼보르 프레이 쿡’ 양식이라고 알려진 앙코르 이전 시대 장식적 특징을 볼 수 있다. 상인방, 박공, 돌기둥 등을 포함한 이러한 요소들은 진정한 걸작이라고 할 만하다. 이곳에서 창조된 예술과 건축물은 인근의 다른 지역에게 하나의 모델이 되었고 앙코르 시대에 와서는 고유한 크메르 양식으로 발전하는 밑바탕이 되었다.